I must admit, Indian Banks are very clever. Banks always find out the way around to protect their territory. Non-Maintenance of Minimum Balance is a major issue for the banks to handle. Banks incur the cost for keeping and servicing the Savings Account. Banks recover this cost by imposing minimum balance criterion i.e. an amount which should be reserved in the savings account on a regular basis to recover such cost. Charges imposed for Non-Maintenance of Minimum Balance generate substantial revenue for any bank. It is one of the most widely levied penalty by any bank. regular basis to recover such cost. Charges imposed for Non-Maintenance of Minimum Balance generate substantial revenue for any bank. It is one of the most widely levied penalty by any bank. Making it necessary for account-holders to keep a minimum balance, the State Bank of India (SBI) on Thursday said it will be charging nonpayers a penalty from 1st April onwards. Making maintenance of Rs. 5,000 compulsory for accounts in metropolitan areas, Rs. 3,000 in urban areas, Rs. 2,000 in semi-urban areas and Rs. 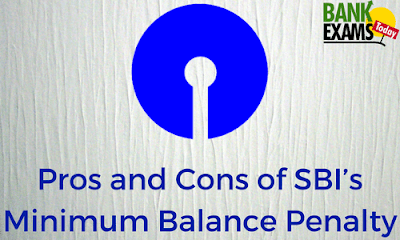 1,000 in rural areas, the SBI listed out the charges to be effective from April 1. The charges will be based on the difference between the minimum balance required and the shortfall. For city areas, if the shortfall is greater than 75 percent, then the charges would be Rs. 100 plus service tax. If the shortfall is between 50-75%, the bank would charge Rs. 75 plus service tax and for below 50% shortfall, a fee of Rs. 50 plus service tax would be levied. Likewise, for rural areas, the penalty for non-maintenance of minimum balance ranges from Rs. 20-50 plus service tax. Assume, if you get a new bank account with your new job. Your old bank account is left unobserved without minimum account balance as it used to be salary account. After some period, you may realize that your account is useless. The bank has converted your salary account to normal saving account. Now it is charging for non-maintenance of minimum account balance. If it has been one year (time passes swiftly) then you have to pay more. You can forget your unused account for more than a year. The major disadvantage is that regardless of shortfall, charges levied are fixed. In short, the normal penalty fixed, even if the shortfall is Rs 1 or it is Rs 5000. Second drawback is that banks are allowed to make negative balance i.e. banks keep on levying the charges and customers bank balance becomes Negative. In most of the cases, account holders are unaware and when they deposit money, the money will be deducted automatically. To avoid the sudden deduction of money, RBI issued some guidelines. Penalty for Minimum Balance necessity will be in proportion to the shortfall in the Minimum Balance. Charges will be according to slab structure which will be fixed with wide criterion of fixed percent of the difference between the actual balance maintained in the account and the minimum balance required. It will be the duty of a bank to inform the customer through SMS/Email/Letter regarding charges when minimum balance requirement is broken. Banks will not be able to create the negative balance. Account will be declared inoperative. Bank may limit the services available to such accounts. For example, bank may limit no of branch transactions or restrict usage of debit card if the minimum balance is not kept. Customer will have 1 month grace period to restore the Minimum Balance in account from the date of receipt of notice from the bank. Penal Charges can be levied only after 1 month’s grace period. Any Penal Charges levied in this regard will be informed to the customer. Charges cannot exceed the actual cost of providing the service and must be reasonable. Sir when we got a New bank account with new job then how long will it take to convert old sallery account into normal saving account...having gotten new sallery account will it be automatically converted into saving account or when bank realize that there is no activity in this account let convert into saving account...???? ?